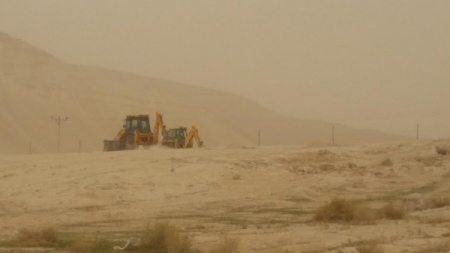 Israeli bulldozers seen preparing the Palestinian-owned land in Fasayal, Jordan Valley. During the past 6 months, the Jordan Valley Solidarity Campaign has registered further land grabbing in Fasayal village in the Jordan Valley. The land, which originally belonged to a Palestinian owner, was invaded 6 months ago by Israeli authorities accompanied by settlers from nearby illegal Israeli settlements and bulldozers. Locals say that they were seen working on the land in order to level the surface of the soil to prepare it for planting trees. Locals reported that on the 19th of December Israeli authorities with Israeli settlers were digging holes for trees; so far, 400-500 date trees have already been illegally planted on the ground. As 87% of the Jordan Valley is declared area C [PDF] and an additional 7%, which is formally part of area B, is declared a nature reserve, most of the Jordan Valley is off limits for the Palestinian people. Furthermore, 50% of the area is controlled by the illegal Israeli settlements, and 45% is declared military bases, “closed military zones,” “nature reserves,” and “firing zones,” denying access for Palestinians and facilitating the demolitions of Bedouin tents, houses, wells etc. In area C obtaining permits to build schools, hospitals, water networks, roads or other basic service infrastructure is practically impossible, which violates the basic needs and human rights of the residing Palestinian population. Israeli forces destroy infrastructure and buildings built without a permit. By oppressing the people in the Jordan Valley in this manner, Israeli occupation forces have succeeded in decreasing the Palestinian population from 320,000 in 1967 to approximately 55,000 people. In the same four decades, 37 illegal Israeli settlements have been established and are now housing 10,00 settlers, who enjoy a 75% discount on their water bills and cheap stolen land. In contrast, Palestinians suffer from extreme lack of access to water by having their water tanks confiscated and their wells demolished. 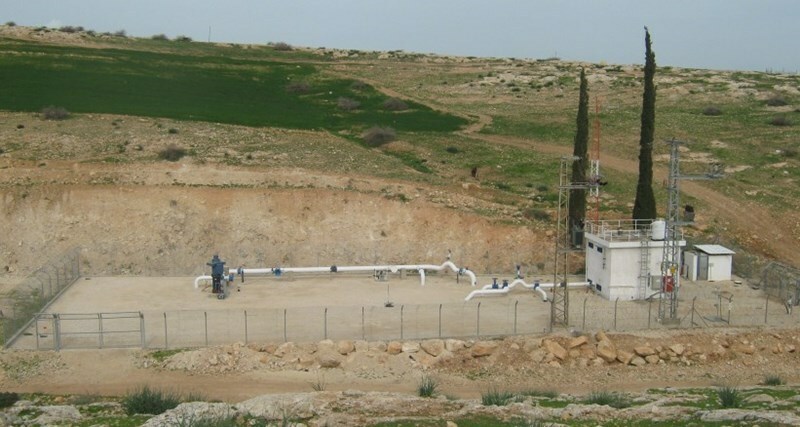 Furthermore, the Israeli authorities prohibit Palestinians from digging new wells or reallocating old wells, forcing Palestinians to have wells only 150 meters deep where the water is either salty or nonexistent due to the construction of Jewish-only wells nearby. Israelis are allowed to dig 400-500 meter wells, sometimes hitting salt beds causing the water in the Palestinian wells to be salty. Israeli occupation troops Monday rolled into the Deir locality in the northern Jordan Valley and confiscated Palestinian-owned water pumps, a few months after they notified the demolition of all civilian homes in the area. Palestinian citizen Ali Daraghmeh, a native of the Deir Hamlet, told a PIC journalist that an Israeli army force broke into the area and seized water pumps, used for agricultural purposes. He added that evacuation and demolition notifications have been handed to some 30 Palestinian families in the village. “Never ever shall we succumb to Israel’s policies of ethnic cleansing. We will not leave our own and only homes,” Daraghmeh said. He said historical and personal documents corroborate that Palestinians have historically been the only owners of the land. For the local Palestinian communities, who had set up roots in the area long time ago, agriculture and livestock are the main sources of livelihood. Israeli bulldozers on Tuesday destroyed a water tank and artesian wells, along with a set of agricultural equipment, in the northern West Bank city of Jenin. Head of the local village council Talel Hussein said in a statement Israeli bulldozers knocked down three artesian water wells owned by the Palestinian farmers Imad Ismail Jaradat, Suleiman Zyoud, and No’man Jaradat. He said the demolition was carried out in the early morning hours and without prior notifications. He added that the demolition, carried out under the supervision of the Israeli planning and building authority, targeted the villagers’ only water tank. The Israeli occupation soldiers further uprooted dozens of olive trees in the area, destroying the farmers’ own and only source of income. Hussein further spoke out against the serious repercussions of such procedures on the adjacent Palestinian villages. He said the move has not been the only one of its kind against Palestinian farmers and civilian structures in the area. He urged the concerned authorities to immediately step in and work on defending Palestinians against such oppressive and illegitimate measures carried out by the Israeli occupation and its branches across the occupied Palestinian territories. A study released Thursday by the Department of Legal Affairs at the Palestinian Ministry of Justice warned of the serious upshots of Egypt’s flooding of Gaza borders with high-salinity water, dubbing the project a violation of international laws and conventions. A study conducted by the Justice Ministry found out that Egypt’s pumping of seawater into the borders with the blockaded Gaza Strip leads to the destruction of the aquifer. According to the study, the move is a flagrant violation of the UN’s resolution on the proper management of trans-boundary aquifers, the peaceful sharing of groundwater resources, and the need among States to cooperate in order to prevent pollution and the destruction of shared aquifers. Experts, who conducted the study, warned of the menacing repercussions of the destruction of Gaza’s aquifer, saying Egypt’s attempt to protect its borders does not permit it to do harm to Palestinians. The Justice Ministry called on all concerned parties to immediately step in and stop such a destructive project. In what observers branded an unprecedented move set to please the Israeli occupation, the Egyptian army forces have begun to pump water from the Mediterranean Sea into underground tunnels on the southern borders of the besieged Gaza Strip since last September. According to Gaza’s Water Authority, the move poses a serious threat to the Strip’s water and food security. Palestinians in Gaza are living under inhuman conditions due to the tough siege imposed by the Israeli occupation and also due to Egypt’s quasi-permanent closure of the Rafah border crossing. 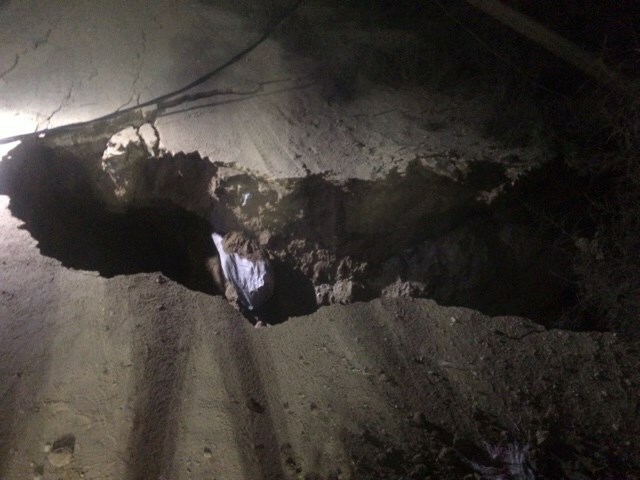 The Egyptian authorities have continued to flood the Gaza-Egypt borders with high-salinity seawater as part of intents to destroy cross-border tunnel activity, resulting in remarkable damage in Gaza’s fauna and flora. Palestinian security forces and civil defense crews rushed to the scene to protect Palestinian civilians and children from being drowned beneath the high-salinity waters as large pools of seawater stacked one over the other in the area. Local sources told a PIC journalist that high-salinity sea water has been leaking into the Palestinian side of the border area after the Egyptian authorities stepped up pumping of seawater into Gaza’s borders with Rafah city. In what observers branded an unprecedented move set to please the Israeli occupation, the Egyptian army forces have begun, since September 11, to pump water from the Mediterranean Sea into underground tunnels on the southern borders of the besieged Gaza Strip, harming nearby civilian homes and cultivated land lots. According to Gaza Water Authority, the move poses a serious threat to the Strip’s water and food security. The Israeli settlements sewage water has polluted spring water and plants in the city of Salfit. Local farmers informed the PIC that the Israeli settlement of Yakir pumped sewage water into Palestinian agricultural lands to the west of Salfit. This water then polluted the plants, and the spring water in the area, they added. Twenty four Israeli settlements including four factories pour their sewage water in the valley of the city of Salfit while land leveling works in the area is routinely reported for settlement expansion. In another context, Jewish settlers in Nablus ran over a herd of sheep at dawn Tuesday near Aqraba town to the east of the city. 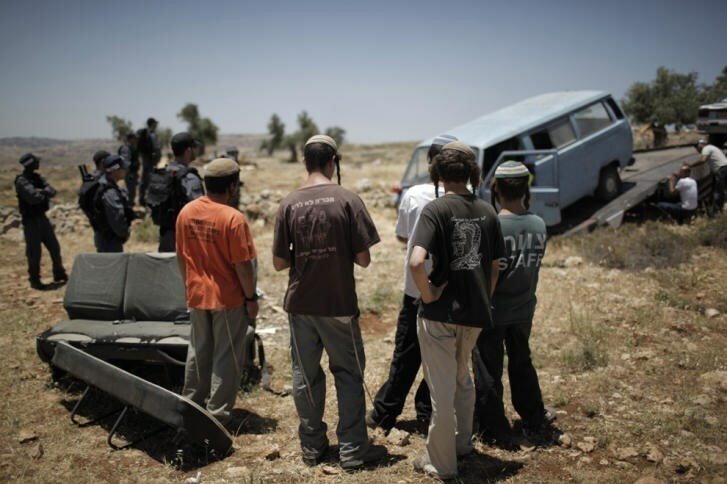 Shepherd Ayesh Daajnah told the PIC reporter that Jewish settlers in a vehicle ran over his herd of over 300 sheep. 40 sheep at least were crushed and 30 others were injured. He pointed out that Israeli forces refused to count all the dead sheep, appealing to competent authorities to make up for his loss. He asked for an investigation into the incident.